January 6, 2017, 7:48 AM · Do you remember the hotshot violinist in high school who had no trouble playing virtuoso pieces? How about the young player with great posture and the golden sound? As impressive as they were, there were flaws here and there, lots of out-of-tune notes, or a skewed rhythm with a sudden surge of dynamics. 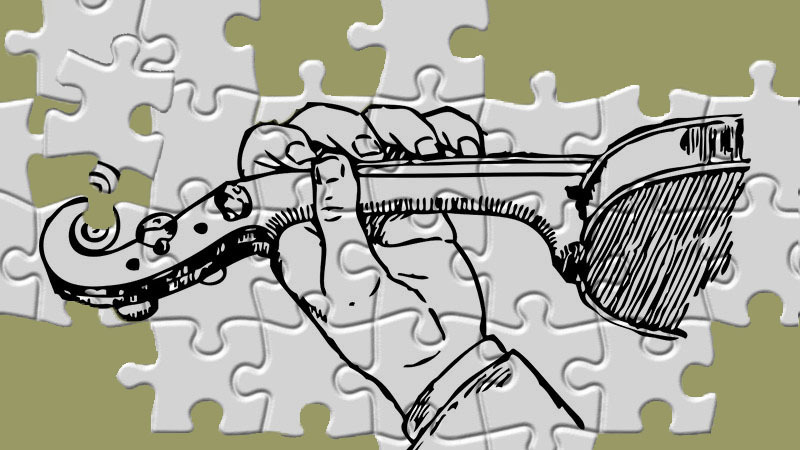 Talent is often accompanied by music's multitude of side effects, and the violin's particular requirements (bow distribution, string crossings, etc.) just add more things that can go wrong. Talent also has a way of growing without solving all the little things that beg for attention. Nurture a child's virtuosic tendencies without slowing him down to observe the details, and you may produce fast fingers with weak bowing. The violin is a mistake machine, and young violinists are just as likely to develop careless execution as impressive speed. The easy path is to stick with what works. If a student has a very agile left hand, the teacher might focus on making the same, strong element of his technique even stronger. However, it would better for the child's long-term development to make the bow arm as strong as the left hand. As one hand gets better, make sure the other hand keeps up. Reinforcing only a student's strong points has only one benefit, which is making him or her feel comfortable. Children who play by ear, who emphatically don't look at the music, get pleasure from hearing music and producing it without other thoughts. However, if his weakness in reading music were strengthened to the point that it was equal to his playing by ear, the benefits would include knowing how music works and the ability to play anything without hearing someone else play it for him (or her). One of the hardest things to learn in music is to play the music one way, while changing one thing and keeping the rest the same. It sounds simple, but the act of creating music is anything but simple. The extreme player who can't, or won't change his course, can become over-confident because he or she keeps getting better in spite of not diversifying. Some virtuosos may have over-developed left hands, but can't sense an upcoming cadence or ritardando. Thinking while playing can be taught. Players hang on to the delicate balance that keeps both hands moving in different directions and different speeds, and wonder why they should even take the risk of upsetting the apple cart. Micro-managing yourself, however, can be the most fulfilling skill you develop. At first it may feel awkward and cumbersome, like you just unbalanced the load in your washing machine, but, as you get better at it, it will make you both a better section player and a better leader. One thing orchestra playing has taught me is that the phrase contour and the dynamic are pretty hard to ignore. When the orchestra is playing the Nutcracker Suite, for example, it should be obvious how to play each note. There's the conductor making the music look one way, and 100 musicians following him, for all intent and purposes, exactly. It's almost impossible to ignore the herd. The skills of blending in with the musical status-quo of the musicians around you and predicting what's going to happen next in a typical phrase should be one of the foremost goals in a musician's mind. If you ask yourself not what sets each of us apart, but what do we all have in common, you will be closer to achieving those skills. Figuring out the similarities of accomplished musicians is not an easy task. It requires a keen analysis of not only how the engine of music runs smoothly, but also how it breaks down due to human error. Once you observe and absorb the basics, that is, the flow, contour, pitch center, etc., its time to pay attention to the little changes that the conductor asks for. What started out as normal, the phrase in its pure, well-proportioned form, becomes a slightly altered, usually improved form. And with the stroke of the conductor/chamber music leader, the normal becomes the new normal. The plan sounds so simple: Music is a language as predictable as speech. Listen carefully and you hear beautiful patterns and shapes that are exquisite in their symmetry and god-like creation. Then change one thing, such as rubato or dynamic, and everything around it changes to meet the newly defined character. The plan is simple. But to see, interpret and understand it is anything but simple. Human error miscalculates and interferes. There is an elegant system by which music lives and breathes. It enables reasonably intelligent people to create it, and to keep getting better at it. It is the sum of all the parts that we painstakingly practice when we're young and old. It is made up of an unusual combination of skills: how we anticipate and how we create a flow around a fairly fixed beat. The renowned artist Marcel Tabuteau, Principal Oboist of the Philadelphia Orchestra from 1915-1954, taught several generations of students how to understand music's phrasing and the rhythmic jigsaw puzzle that surrounds it. The foundation of his system explained music's ability to sound rhythmically even but at the same time have forward motion. It sounds complicated, but it really is quite straightforward. It used a numbering system to show how a note builds to the next note, so the notes would never sound stagnant. The numbers that Tabuteau used perfectly described how great phrases emerge. What appears two-dimensional on the page is transformed to lilting melodies with poetic inflections. I recommend a thought-provoking book on Tabuteau by David McGill, Sound in Motion: A Performer's Guide to Greater Musical Expression (Indiana University Press). Mr. McGill was the Principal Bassoonist of the Chicago Symphony from 1997-2014. His experience has taught him the complicated world of making music with so many colleagues and so many opinions. The clarity of his vision and analysis bring surprising insights. Instead of a detailed analysis of intonation, he advises wind players to listen to the strings and go with their pitch. If a wind player tried to play in tune with each wind player, all the individual pitches might clash. On the other hand, the strings will play with a unified pitch, or something close enough. Wind players might as well remember, it's pretty hard to stray from the herd. January 7, 2017 at 03:46 PM · Excellent post! Thank you! My favorite lines: "The skills of blending in with the musical status-quo of the musicians around you and predicting what's going to happen next in a typical phrase should be one of the foremost goals in a musician's mind. If you ask yourself not what sets each of us apart, but what do we all have in common, you will be closer to achieving those skills." This can be applied to choral singing as well! January 10, 2017 at 07:15 PM · This reminds me of an epiphany I had on a warm summer evening years ago. I was walking along a side street past a firehall, whose brass band was practising outside. Suddenly I saw the music as a separate entity hovering above them. The people weren't just playing with each other; each of them was reaching toward that ideal union which was the music itself. When I play in our orchestra I try to remain aware of the music and follow its lines - while watching for the nuances that the conductor introduces. We're all working together to build something living and beautiful. January 12, 2017 at 05:25 AM · Charlie, your memory of the marching band clearly describes the wonderful phenomenon of how music links up with our ears. Instead of the futile attempts when we try to create music out of our personal whims, you have described how the greatness and simplicity of music pulls us up to its level.